Black Coffee is a novelisation by the Australian-born writer and opera expert Charles Osborne of the 1930 play of the same name by crime fiction author Agatha Christie. The novelisation was first published in the United Kingdom by HarperCollins on 2 November 1998 and in the United States by St. Martin's Press on 31 December 1998. It features Christie's famous literary creation Hercule Poirot, a London-based Belgian private detective. Until the 1998 publication of the novel, the play on which it was based was one of the least known pieces in the Christie canon. The publication proved successful enough to warrant adaptations by Osborne of two other Agatha Christie plays, namely The Unexpected Guest in 1999 and Spider's Web in 2000. Hercule Poirot – The protagonist. A detective known for his "little grey cells". Sir Claud Amory – A reclusive, rich scientist. He dies from hyoscine poisoning via his black coffee. Richard Amory – Sir Claud's only son. He had to quit the army and now lives with his father. He has tried several businesses and has failed to earn any real money. Lucia Amory – Richard's wife. Lucia is an Italian. She and Richard met a year ago, fell in love and got married. Her mother died before she met Richard and very little is known about her life. Caroline Amory – Sir Claud's spinster sister. Caroline is a prudish woman who symbolizes Victorian ideals. She may be under her brother's thumb, but is practically the matriarch of the household. Barbara Amory – Sir Claud's and Caroline's niece. Barbara is polar opposite of her aunt and seldom thinks twice before saying something. Edward Raynor – Sir Claud's secretary. Dr Carelli – An acquaintance of Lucia, presumably an old Italian friend. Lucia and Carelli met after a long time some days ago, and now he is a guest at the Amory residence. His background is as vague as that of Lucia's. Hercule Poirot and his friend Hastings are called upon to visit the home of the famous physicist Sir Claud Amory, who has devised the formula for a new type of explosive; but they learn that he has been poisoned (in his black coffee, hence the title) the night of their arrival. Poirot is now confronted with the challenge of figuring out which of the array of other people gathered at the Amory residence is the murderer. He questions every single person that was present at the night of the murder. He then concludes his investigation with the help of an old friend from Scotland Yard. Sir Claud Amory calls Poirot and informs that someone in his own household is attempting to steal a formula of a new explosive being developed by him so he calls Poirot right away. Meanwhile, it is revealed that the formula has been stolen and the Amory household is unaware of the development. In the household, Lucia excuses herself from the dinner claiming to be feeling a bit ill. Caroline follows Lucia, but it is evident that the latter just wants to be left alone. Richard arrives as the women are talking, Caroline leaves the room. Richard and Lucia had a love marriage, but now he suspects her infidelity as he has seen her communicating secretly with Carelli. Lucia denies the allegation, but provides no further explanation. Some time later, Caroline rejoins the duo along with Barbara. As the ladies start talking, the conversation takes turn to the topic of a female relative of the Amory's, a doctor who resides in India. Barbara retrieves the doctor's bag which was kept on top of a cupboard. The women observe the chemicals found in the box when Dr. Carelli enters the room. He sees the bag and starts explaining what the chemicals in the bag do. He concentrates particularly on hyoscine hydrobromide, which could put a man in "a dreamless sleep". Later, Lucia secretly empties almost the whole vial of hyoscine, which is seen by Edward Raynor, the secretary of Sir Claud. Edward doesn't let her know the fact. Some time later, Edward takes a cup of coffee for Sir Claud, but is stopped by Lucia, who tells him that he has the wrong cup. He takes other cup and goes to his masters room. After some time, Sir Claud joins the room as well. Moments later, Lucia proceeds to exit the room, but is unable to open the door. At this point, Sir Claud announces that the door is locked from outside. He explains what has happened and plainly tells them that one of them is a thief. He offers a deal: after one minute, the lights will go off. Whoever stole the envelope containing the papers should put it on the table, following which no questions will be asked. But once the lights turn on, if the papers are not there, the matter will be out of their hands. As the lights go off, a sound of something striking against metal is heard, followed by Lucia's frantic requests to release them. The noise of some fabric tearing is also heard. After the lights return, everyone is pleasantly surprised to see the envelope on the table. Just then, Poirot enters the scene. Richard greets Poirot and tells him that the matter is resolved. However, Sir Claud is found to be dead in his chair and the envelope is found to be empty. Poirot starts investigating after Lucia implores him to do so. Richard gets angry at her, reminding her that his father commented that "the coffee tastes bitter." Realizing that this could implicate either or both of them, Lucia tries to dissuade Poirot, but in vain. Later, when Poirot and Hastings are hiding in the room, Lucia enters and substitutes a cup for another. 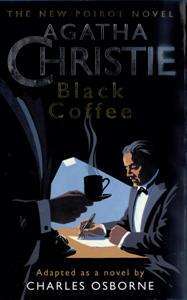 Poirot surmises that Sir Claud was poisoned via his coffee with hyoscine, which is confirmed by the family doctor Kenneth Graham. As Poirot starts interrogating the family members, he senses that they are intent on hiding something. Also, he finds letters written to Sir Claud telling him to keep distance from the child of Selma Goetz. Poirot learns that Sir Claud learnt of the theft by accident. He establishes that Sir Claud was already poisoned when he had everybody locked in the room. A key is found beneath Edward Raynor's chair, which is found to be the copy of the key of Sir Claud's safe. Poirot later calls Lucia again for questioning. Here, Poirot exposes her to be the daughter of Selma Goetz, an international spy who died some years earlier. Lucia confesses that Carelli was blackmailing her and wanted her to steal the documents, but denies the theft or murder. The key was made by Carelli so that he could open the safe and steal the documents. Lucia claims that she stole hyoscine for herself: she intended to commit suicide before Richard found out her secret. Poirot now reveals that he knows about the cup she has hidden. In a fit of hysteria, she admits to murdering Sir Claud. Richard, believing that Lucia committed the murder, claims that she is taking his blame on her. Poirot reveals to him that neither of them is guilty. Later, Poirot calls Hastings in the room and explains what happened: When the lights went off, Lucia threw the duplicate key in such a way that anybody would think that the thief threw the key towards him. He points to the sound of tearing of dress, since none of the members dress was found to be torn. Poirot tells that it was not a cloth that was torn, but paper. He reveals to Hastings that in a vase by the fireplace, somebody had hid the now torn scraps of the formula. Putting the scraps back in the vase, he and Hastings pretend that they have not guessed the truth. Now only Raynor is home, while Poirot sends Hastings and Japp on some errands. Poirot complains that he feels famished due to heat. Raynor brings two glasses of whiskey, one for himself, one for Poirot. Poirot starts explaining the case to him. He suddenly stops as he thinks somebody is overhearing the conversation. Poirot goes and opens the door, but finds no one. Poirot now points out that the box containing the chemicals was empty, while the cupboard on which it sat was caked with dust. It meant that someone had handled the box before Barbara . Now, he accuses Raynor of murder. He stole the formula and had decided to kill his master on a later day, but he had to hasten his plans when the theft was found. Poirot suddenly realizes that his whiskey tastes bitter. Raynor mockingly accepts the accusations, but Poirot has difficulty talking or listening to him. Raynor tells him that his whiskey has been poisoned as well. Before he can show the hiding place of the formula, Poirot passes out. Realizing that Poirot is dead, Raynor quietly retrieves the formula and puts it back in the envelope. As he turns to escape, he is apprehended by Hastings and Japp. Poirot surprises him by getting up, revealing that when he went to see who the "intruder" was, he simply exchanged his poisoned cup for another one with help of Hastings, who was hidden there. After Raynor is arrested for his crime, Poirot leaves the place, but not before re-uniting Richard and Lucia. The Black Coffee play was filmed for a second time, this time in France, by Les Établissements Jacques Haïk. It was released as Le Coffret de laque on 15 July 1932, and internationally as The Lacquered Box.